"Lemme describe an Imp pilot for ya, Artoo—lotsa guts wrapped up in a little skill with no brain." TIE pilots served in the Starfighter Corps of the Imperial Navy by piloting the various TIE Series starfighters. Distinguished by all-black flight suits and bulky, fully enclosed, vacuum-sealed helmets, the Galactic Empire at its height produced millions of TIE pilots and generally considered them expendable assets. The TIE pilots formed the elite of the Imperial Navy's Flight Branch. They were referred to as "bucketheads" by Rebel pilots, due to their bulky helmets. Within the Imperial forces they were often referred to as "coffin jockeys" due to the high mortality rate of those manning the vulnerable TIE fighters, a holdover from the Galactic Republic's use of clones during the Clone Wars prior to the Empire's formation. Among the pilots, they were known as "vac-heads" and "ground-hogs," in reference to their roles in the Navy and Army, respectively, due to a significant rivalry between the two factions. The first generation of TIE pilots was composed of clones, survivors of the clone trooper pilots of the Republic Starfighter Corps from the Clone Wars. The first clone pilots were first-generation Jango Fett clones, but the best clone pilots were honored as the prime clones for newer pilot lineages, and were distinguished by their all-black dress uniforms. This early use of clones was one of the main reasons why TIE pilots were often viewed as expendable and given little protection during combat. Even early into the Empire, however, there were several Imperial officers, among them the distinguished TIE ace Shea Hublin, who campaigned to have the various TIE fighters redesigned to protect the pilots better, largely because non-clone Human pilots from the Imperial Academy began to replace and outnumber the aging clone trooper veterans. However, these were ignored by the Imperial Navy's hierarchy, and notably were dismissed by the pilots themselves. The TIE pilots believed that their lack of protection was a testament to their skills rather than the Empire's view of them as disposable. This notoriously callous treatment of pilots was such that the TIE fighter, in addition to representing the technological might of the Empire, was also symbolic of the Empire's disregard for its own soldiers. At the height of the Galactic Empire, the Imperial Navy had countless Academy graduates and clones at its disposal. During the time of the Imperial Remnant and the reign of a reborn Emperor Palpatine, the Empire was forced to be conservative with the lives of the TIE pilots due to their decreasing numbers, and unmanned TIE/D automated starfighters were used as support craft for living pilots. Eventually, Imperial commanders like Grand Admiral Thrawn were forced to recognize that their pilots and starfighters could no longer be treated as expendable assets, and began fitting TIE/IN interceptors with deflector shields. "I attended the Academy, and I have nothing negative to say about the Imperial training program, but nothing can prepare you for true space combat. You need to know your life is on the line, that your next move could destroy your enemy or put you directly in his firing vector." They represented the elite of the Imperial Navy, having undergone grueling physical and psychological conditioning to achieve their ranks. An elite corps, only 10 percent of TIE pilots successfully navigated the intense training and testing of the Imperial Navy. The rest were reassigned throughout the Navy as combat gunners, crewmen, and other personnel. Drawing from the graduates of Imperial academies, the fleet conditioned their best prospects to be fanatically loyal to the Emperor and willing to sacrifice their lives and the lives of their fellow wingmen to complete their assigned missions, explicitly considering themselves expendable. In addition, they also were trained through intense psychological conditioning to focus on target destruction, and took particular pride in being totally dependent on higher authority. To ingrain the concept of placing mission and Empire above self, TIE pilots' names were replaced with identification numbers (such as DS-61-2), and they were subjected to continual reminders of their craft's lack of integrated life support and combat deflector shields, use of the latter being viewed as an act of cowardice. Potential non-clone pilots were required to undergo a rigorous screening and selection process for flight training, with those who passed proceeding to spend a year in one of the Empire's flight schools. The flight schools' locations varied between asteroid bases, planets, and capital ships. Once they arrived at the flight school, the pilot would be assigned to a partner and learn to operate as a team in combat, necessitating hundreds of hours of flight drills. However, the flight schools were not safe, as attrition was high especially to trainee pilots assigned to actual combat missions. Those who survived and passed came closer to getting a recommendation into the Starfighter Corps. Several of the flight challenges they had to endure were both strategic and high-speed related, and were described as filtering out the weak. TIE pilots on duty were deliberately kept emotionally unstable and in a constant state of insecurity. This was believed to let them fight more efficiently, although it frequently caused trouble in their interpersonal relationships. They were a closely knit group and tended to stick to their own kind, avoiding others in social interaction. The Imperial Navy considered this an acceptable tradeoff for their flight performance. Internal rivalries between the mainstay pilots of the Imperial Navy and the TIE pilots assigned to the Imperial Army branch via the ground support wings were considered "legendary" and resulted in the derisive nicknames of "Vac-Heads" and "Ground-Hogs," respectively. Cantina owners separated them in their cantinas after learning the nature of their rivalry via violent encounters. Although they did have a close-knit relationship among their own kind, they also placed the mission above even aiding any threatened wingmen. When piloting TIEs, pilots' feet operated the control yokes and their hands gripped the control rods, while their bodies were strapped into a shock couch and crash webbing. This gave TIE pilots a claustrophobic sensation, although the best ones viewed it as the best in the galaxy. In some cases, TIE pilots were also trained via simulations, and often had four training operations for each vehicle. They were awarded medals signifying how many training operations they had completed: Bronze indicated that they had completed half of the training sessions, silver that they had completed three quarters, and gold that they had completed all training sessions for a vehicle. The simulations were generally based on past battles considered notable enough to train future generations on their strategies. A similar form of simulated training called training simulators had the trainees piloting various crafts in a simulated obstacle course where they fired upon various targets while completing laps within an allotted time. Completing five laps earned the pilots a training patch modeled after the attack craft they tested in the simulator. 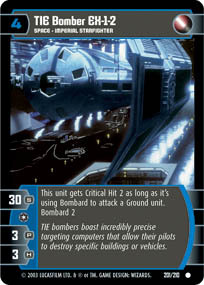 Due to their discipline, TIE pilots when undergoing missions often fly in formations of up to five TIE fighters. However, if the unit leader ended up shot down first, the remaining TIE pilots tended to scatter. Some TIE pilots who proved exceptionally skilled were promoted to cruisemissile troopers, which piloted the cruisemissile assault crafts that acted as spearheads for Imperial Navy operations against Rebel outposts. Unlike the TIE pilots and their relatively autonomous role with their fighters, however, cruisemissile troopers were directly affixed from the waist down to their craft. "Don't let the fleet commanders fool you: battles are fought — and won — among starfighters, not capital ships. Flying a fighter requires a sharp eye, firm knowledge of spatial mechanics, and a keen tactical sense." To a TIE pilot, the success of a mission eclipsed personal safety and even the safety of fellow wingmen. Imperial tactics and command-control procedures for TIE squadrons were based on the assumption that most of the pilots were new and inexperienced. They were generally not allowed to use the same vehicle more than once, though this practice declined as the number of available ships began to decrease. As a result of these early measures they developed little or no attachment to a particular craft as their Rebel counterparts did. This mindset helped to enforce the pilots' view of themselves as a part of the Imperial war machine. They regarded themselves as expendable and were trained to regard their vehicles as the most expressive instrument of the Galactic Empire. 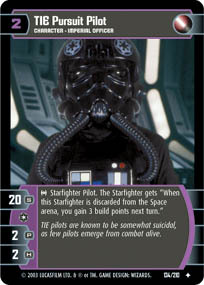 As a result, TIE pilots were loyal and willing to die for Emperor Palpatine. Their primary missions were to attack Rebel and pirate ships and defend space stations, convoys, and planetary garrisons. They also escorted TIE/sa bombers on planetary assaults. Much of a TIE pilot's time was spent in a TIE cockpit on patrol duty. Besides TIE-series fighters, TIE pilots also took to piloting other starfighters, including the Alpha-class Xg-1 Star Wing Assault Gunships and the Missile Boats. TIE pilots were stationed among either the Imperial Navy or the Imperial Army, with their duties varying depending on the branch. The latter reported to an Army garrison commander, although they were primarily stationed aboard a naval vessel. This also led to an intense rivalry between the two factions of TIE pilots. "You want to survive, you got to think like the Imperial bucketheads." 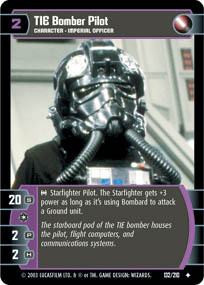 TIE pilots were equipped with black uniforms composed of an energy-shielded fabric, a black flight helmet, positive gravity pressure boots, and a life support chest piece with breather tubes connected to the helmet to provide necessary gases. Functioning as vacuum G-suits, these uniforms were necessary because the various TIE craft, with few exceptions, lacked life support. The helmets also featured ship-linked communications systems on the sides, and were highly reinforced. Han Solo, a former Imperial pilot, implied that the experience of wearing one of these uniforms was maddening due to having to endure the stink of sweat as well as constantly hearing the hissing of breathing tubes for a few hours in a cockpit. Although the standard TIE pilot uniform is not actually required for piloting the TIE/sa bomber due to it being equipped with life-support systems, the pilots nonetheless wear the standard flight suits in case of an emergency. The uniforms for TIE bomber pilots was slightly different compared to the standard flight suits, namely possessing a clear viewport for the eyes in their helmets. The helmet design was reminiscent of stormtrooper armor, with a few notable distinctions. The shell was bulkier, possibly due to reinforced padding or internal pilot-to-ship communications equipment. Additional modifications enabled the pilot to survive in the cockpit's vacuum. Breather tubes extended from the helmet to the front of the breastplate, where controls for the suit's portable life support system were located. The actual supply of oxygen was built into the rectangular back plate of the armor. Because of the similarities of the helmets to stormtrooper armor, the official field manual for the Imperial Military, Imperial Handbook: A Commander's Guide had to specifically state that despite the similarities, the TIE pilots were part of the Navy, not the Stormtrooper Corps. However, despite the distinctions between the Stormtrooper Corps and the Imperial Navy branches, it wasn't unheard of for someone to be both a stormtrooper and a TIE pilot. Because the odds of surviving a crash were slim, TIE pilots were rarely equipped with emergency rations or supplies. Some carried a personal sidearm for reasons which may have been ceremonial. These did get used, however, when opposing forces would attack TIE pilots before they could take off. When not on duty, their dress uniforms were the same as various Imperial Navy officers, although in some cases, such as Captain Yorr and Captain Juno Eclipse, they wore uniforms that were more similar to the dress uniforms for Stormtrooper Corps officers. "Barge drivers. What kind of plastiheads is the Empire recruiting for pilots these days?" Notable TIE pilots included Han Solo, who later turned galactic smuggler; Biggs Darklighter, who defected to the Rebel Alliance and 181st Imperial Fighter Wing member Baron Soontir Fel, who defected to the New Republic. These men were Academy graduates and officers in the Navy. Another famous TIE pilot was Tycho Celchu, who defected to the Rebel Alliance, and became a well respected member and eventually commander of Rogue Squadron. Another notable pilot was Maarek Stele, who was also a Prophet of the Dark Side. Civé Rashon was one of the rare examples of a woman who had become a TIE pilot and, even rarer, a squadron leader. Juno Eclipse commanded the elite Black Eight Squadron, but following the Bombing of Callos, was reassigned by Darth Vader to be Starkiller's personal pilot. Lieutenant Commander Villian Dance was a TIE pilot stationed aboard the Death Star I around 0 BBY. He was in command of a squadron designated Alpha Squadron. Lieutenant Kasan Moor, another example of a female TIE pilot, was the leader of the 128th TIE Interceptor Squadron but joined the Rebel Alliance after the destruction of her homeworld, Alderaan. In addition, there was at least one TIE pilot who also belonged to the Stormtrooper Corps. In Star Wars: Empire: Darklighter, Biggs is wearing TIE pilot gear with a feature the editors point out is not canon: a clear faceplate sealing the helmet in addition to the black faceplate. Because the black faceplate seals off the helmet, an additional clear faceplate does not serve any logical purpose. This was added only so that the artist could identify the characters and allow them to express facial emotions. It is possible that the black faceplate could flip up. However, this is unlikely due to the fact that flipping it up while in flight would prove fatal to the pilot. Transparent faceplates on the armor of clone pilots during and after the Clone Wars have only expanded the discussion; a specific action figure described as an Imperial V-wing pilot has a transparent faceplate on his helmet similar to that of Biggs. In Star Wars Droids 8: Star Wars According to the Droids, Book III, which recounts the story of Star Wars: Episode IV A New Hope as witnessed by R2-D2 and C-3PO, TIE pilots are seen wearing white armor that resembles the armor worn by snowtroopers. A mini-helmet depicting a TIE pilot helmet was planned for the Riddell mini-helmets line of merchandise. However, it was cancelled before it could get past the prototype stages after Master Replicas took over development for the helmet line. The only thing showing its existence was an incomplete set of blueprints that probably would have come bundled with the helmet had it been released. LEGO Star Wars: Microfighters – "video game"
LEGO Star Wars: Microfighters – "Episode 3: Rebel Rally Time"